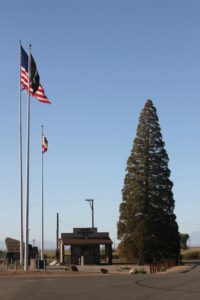 The Roosevelt Pine, a giant sequoia at the corner of U.S. Highway 395 and State Route 168, is a communal tree—the one distinguishing thing that identifies Big Pine. The pine gets decorated for Christmas, is the backdrop for ceremonies at the communities Veterans’ Memorial and the sign southbound Piners are finally home. So, when the call went out it wasn’t in very good shape, the reaction was just short of a blast from the nearby volunteer fire department siren. 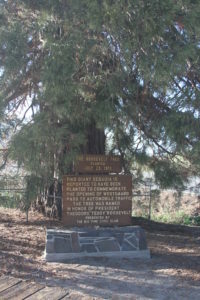 The pine, a pup in giant sequoia years, was planted in July 1913 to mark the opening of Hwy. 168, once considered part of a viable transcontinental highway. Since then it’s been cared for by, first, the Big Pine Improvement Club, then the Civic Club. Sequoias can live to be 3,000 years, reaching a height of 250 feet with a 30-foot girth. Civic Club member Sandy Lund contacted Dustin Blakely, University of California farm advisor. His initial prognosis, having talked with the local caretaker, was “it’s probably OK, but it’s long-term health” was another issue. Blakely explained, via e-mail, damage from stress can’t really be healed. “All you can do is manage the root zone optimally and allow new growth to occur,” he stated. The fact there was new growth was a good sign. Worried eyes turned to the irrigation ditch that runs next to the tree. The ditch is an extension of Baker Creek, part of a system that supplies water to grazing pastures. The ditch was empty early in the week, but obviously hadn’t been for long. Blakely checked the tree out Thursday and reported the tree would “probably be fine from this episode….but the long-term prospects are not so rosy.” The root environment is restricted, he stated in an e-mail. According to the Life Science website, sequoias have shallow roots and require well-drained soil. Next stop: Inyo County Water Department to find out the status of groundwater levels. The response: groundwater is as high as it’s been in the last 40 years. Three monitoring wells within 600 to 1500 feet from the tree indicated a depth to water from two to 12 feet. Despite the fact precipitation and snowpack from the winter of 2017-18 were short of average, the Owens Valley saw an increase in groundwater levels from the epic run-off of 2017 just this past spring. So, the stressor may not be too little water, but too much. 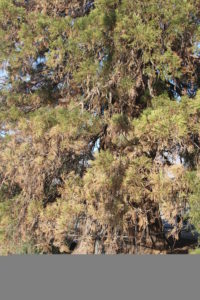 Whatever the cause, Blakely expressed a willingness to meet with locals to figure out a possible remedy to get the Roosevelt Pine back on track for the next 2,900 years or so.